"DECAPITATED HEAD ON AN APPLE TREE" is a little fast fiction especially designed for you to enjoy with your Saturday morning cup of joe. Inspiration has come by way of Sander Sarioglu whose wonderfully narrative work I came across on the cover of the latest Prism Magazine. "Apples will have their revenge !! They will have their comeuppance !!" She shoots him a glare to shut him up and after she's certain of his silence she goes back to selecting Fuji apples. "I'm doing this for you, you know," she says to him while her hands fondle their way through the produce. A trace of a tear forms in the corner of her left eye. 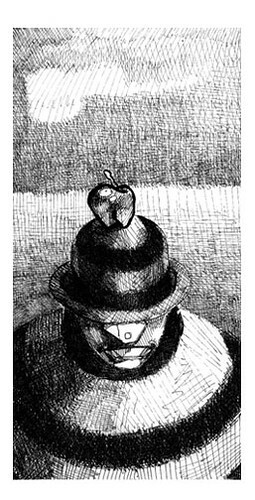 As they move on to the frozen foods, he grabs an apple and plunks it on top of his bowler hat. His hat is stripped and his large wool sweater that stretches out with his fat is also stripped. From the sky the apple makes an almost perfect bull's-eye. If anybody from above sharp-shoots this apple, they'll have to take me as well, he thinks in a whisper to himself. He spends the rest of the day day-dreaming Mother Nature's revenge on our apple-slaughtering society. Months later, after the tumour - which had been pushing his personality into a strange corner of his brain - is successfully removed, the doctor notes its resemblance to a certain fruit. She never buys apples of any sort ever again.